Potting is usually the final consideration in the PCB assembly process. As a chemical engineering process electronic design engineers are not well versed in the interaction between potting systems and the assembly. Learning usually comes from trial and error. With consideration given at the start of the design process and with open discussion with a potting company considerable time and costs can be saved. Potting is the immersion of a part or whole of an electronic or electrical assembly. Potting involves a shell or box, which is retained in application use. Encapsulation utilizes a mould, again the assembly is filled, but the part is then released from the mould and the chosen material forms the exterior casing. We will refer to potting for purposes of this article, as this is the most common process within SMT. It should be noted most aspects do however apply to both terms. Using a potting system provides many benefits namely; Water proofing, protection from; dust, direct contact, dangerous environments, conductive contaminants, chemical attack, reverse engineering, vibration and impact. Potting provides structural reinforcement, electrical insulation and improves heat dissipation. It allows high voltage components to be placed much closer together. Unfortunately, potting and encapsulation are often considered last as it featured in the final stage of the production process and is outside the general knowledge of electrical design, involving chemical engineering. Electronic designers can save time and money if they take a holistic view from the outset and involve a knowledgeable supplier of potting compounds. The most common potting compounds are based on two liquid component systems. The two liquids are mixed together in a denoted ratio to form a solid compound within a specified time. It is often a misconception that ratios can be adjusted between the two liquids to adjust the reaction time to the solid. This is not the case. The ratio of the two components must be maintained accurately in order to achieve the final cured properties of the material. It is also essential that during the mixing of the two liquids care be taken to have a fully homogenized mixture. Any unmixed liquid will not cure and likely cause issues during the assemblies life cycle. • Epoxy – 40 to 150° C with certain systems capable to 200° C.
• Silicone – 60 to 250° C.
These figures do vary based on the product, and exposure period. For example, certain polyurethanes can withstand short-term peaks during the reflow soldering process. How ever these figures can be taken as a good starting point. Polyurethane can be tailored to any hardness Shore 30 00 (soft gel like) to 90 D (rigid glass like). They can offer high elongation, good resistance to tear. The expansion and contraction over temperature range characteristic varies based on hardness. Epoxies are naturally rigid systems at up to 90 D. They have fairly low expansion and contraction characteristics due to their rigidity but are commonly not used in electronic PCB assembly as the rigidity does not match well to solder and is known to break solder joints and stress components during thermal cycling. They also suffer at lower temperatures due to being rigid and therefore brittle, and are sensitive to impact and vibration during off periods in cold zones and in transportation and storage. Silicones are soft systems at 20 00 to 90 A. They have very high expansion and contraction characteristics but being soft in nature they do not tend to interact and stress components, boards or solder joints. Commonly silicones are also used where the electronic design is prone to failure and there is a need to investigate by reworking the board and removing the potting compound. Although this is clearly a contradiction as inevitably assemblies are potted to ensure there are no leak paths. Being able to remove the potting compound shows poor adhesion and is against the very principle of using a potting compound. For example a large number of China’s LED driver producers use silicone so they can repair poor workmanship on electronic designs, but often the failures are associated with water penetration due to the lack of adhesion. It should also be noted how potting compounds cure when selection is being made.1 Curing can have an impact imparting stress to the board, solder and components. Both polyurethane and silicone have a gradual hardening process but epoxy stays liquid for a long period then initiates and cures very fast. Epoxy has high shrinkage rates, which can only be reduced by using fillers, which then makes the material thicker (further explanation is given later regarding thermal conductivity). Epoxies generally are not best suited to potting of PCB assemblies due to their cure rheology. Designers should then consider specification of their assembly and exact purpose of the potting compound. Commonly UL accreditation is required such as 94V0 to give a flame retardant barrier. Potting provides structural reinforcement, electrical insulation and improves heat dissipation. It allows high voltage components to be placed much closer together. The assembly also needs to be considered carefully. Does it have hot spots and how will heat be dissipated. Can the assembly maintain safe working temperatures during peak? Naturally all potting systems are unfilled liquid with relatively low thermal conductivity, as a very general rule 0.15W/(m*K). The formulator/supplier adds specific ingredients and additives to give key benefits. One of these is a filler/powder. Using specific types of filler increases the thermal conductivity. The higher the amount of thermally conductive filler added the more effective the product becomes at dissipating heat. However the more filler added the more this will impact on viscosity, reducing flow and air release. Additionally if the product does contain thermally conductive fillers these are abrasive in nature, increasing process costs, if using automated dispensing equipment. It is therefore essential to assess the exact amount of thermal conductivity required to be able to benefit from the most processable product. An effective supplier has the ability to tailor this. Based on the potting compound properties like hardness, glass transition temperature, E-modulus and the coefficient of thermal expansion and the interaction between the properties of the assembly components like housing, cable, PCB and SMD elements, sensitive components need to be carefully assessed on the board position.3 Will the assembly see thermal cycling effects in use and or the environment they will work within? If so it is essential to consider the geometry of the components and ensure the best layout on board to avoid mass concentration, sharp edges, peak, troughs and excessive differentials of coverage. All can act as initiation points of stress fracture, as the potting material moves and changes hardness during temperature cycling. 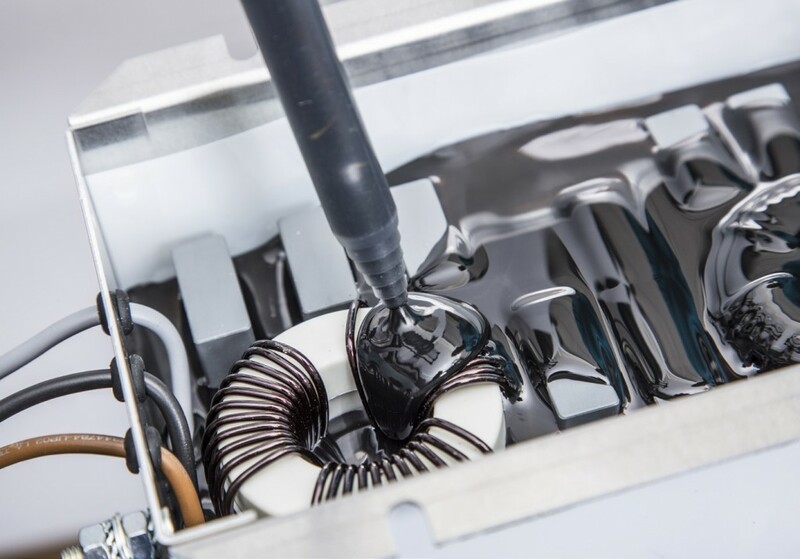 Potting compounds have varying degrees of thermal expansion, glass transition as well as the ability to elongate and so they need to be carefully selected to ensure stress does not occur in the assembly during operation. Also important is a “potting friendly” design, which allows the resin to flow easily into the assembly creating short cycle time in production. Referring back to adhesion of potting compounds silicones have a more neutral effect, as often they don’t adhere to components or the board. If waterproofing or protection to attack from contaminants is required will the potting compound create an effective seal to the surrounding substrates and the assembly by good adhesion? Will the potting compound need any specific electrical property such as dielectric, and does the chosen material fit the required profile. Does the assembly involve HF and UHF. If so will this alter when potted, therefore can it be adjusted so the assembly can function correctly? How will the assembly actually be filled and does it require an automated approach based on volume of units per annum. Does the assembly design allow for easy filling allowing good flow and air release especially if tolerances between board and below board are tight to the housing? Finally what Quality controls will be needed in the potting process to ensure the product remains consistent? As can be quickly seen if the electronic designer does not consider the potting at the outset, problems and redesigns quickly delay the route to market costing considerable time and money. By taking the holistic view from the outset, utilizing the knowledge base of the potting compound supplier, the result is always a much faster, productive and cost effective design. Gary Hayward and the designers at Rasmi in discussion. Gary Hayward, responsible for UK Sales and business development stated – ‘our main focus is polyurethane, as the company name suggests. We are globally active; we have manufacturing and R & D located in 4 locations with distributors and agents across every continent. The Company has been directly involved in the electronic and electrical potting and encapsulation compound business for 25 years’. Table 1 – a UL yellow card is a quick and easy way to determine exactly what the material has been independently tested and rated to. Here we can see the flame retardant class and then the RTI values clearly denoted. Rasmi also had to ensure that the compound had been independently tested by UL labs and had achieved a relative thermal index of 130° C, to ensure that during the lifecycle of the assembly there would be no failure due to the maximum working temperature of some of the components and in application. 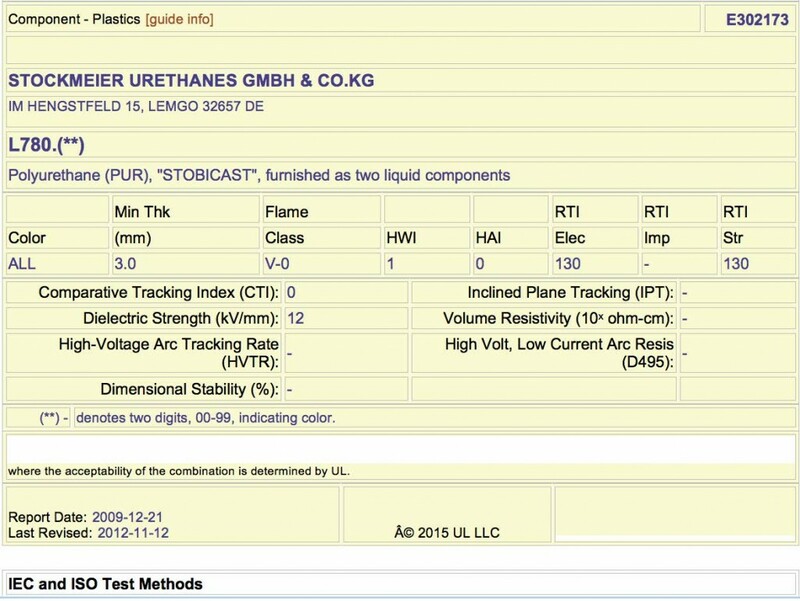 UL currently gives default RTI to materials unless they are tested through their extensive test program to UL Standard UL 746 B Polyurethane5 is generally given a default value of just 50° C, Epoxy is 90° C and silicone is 130° C. Any increase of this value needs the material to undergo a long and rigorous aging program lasting many months. Clearly the client needed something a little more than a standard potting system. Rasmi required the product to adhere to the components and the housing and have low thermal expansion. It would see temperature ranges of -40 to 130° C. The potting system effectively holds the assembly and components in place protecting from impact, vibration, giving a permanent seal against contaminants. 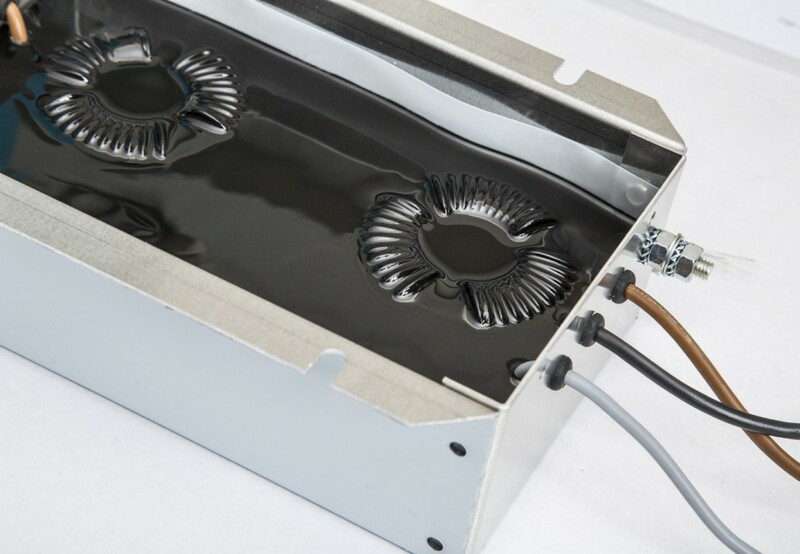 The geometry of the product was also reviewed and it was quickly noted that any product would need good flow and low viscosity to ensure an air free potting and penetration below the PCB board. Rasmi was visited for an initial consultation to discuss, assess and advise material choice based on the assembly. The Rasmi assembly was an EMC/RFI filter for AC/DC servomotors and inverter drives. The assembly contains PCB, SMT, wound components and taking anywhere from 60 grams to over 1 kilo and the volumes estimated would require an automated dispensing process. It was also identified that labour was at a premium so an automated process would assist to keep the cost per unit down ensuring a quick and efficient production process. Factory space was at a premium and Rasmi did not want the assemblies sitting for long cure periods. Previously Rasmi had tried a number of potting materials. Silicones, although acceptable in specification terms were found too intrusive on cost and the possibility of increasing sales volumes would have been commercially impractical. Additionally they faced long cure times. There were also concerns over the ability of any silicone to adhere to multiple substrates found within the assembly, as previously mentioned. Epoxy had also been assessed and was found to be slightly lower in costs but being naturally rigid they had concerns during cycling of the unit as sensitive components could be affected. Again process times were intrusive using epoxy to gaining an effective production system. Following the initial consultation Stockmeier Urethanes presented the specification to its lab and two materials from its Stobicast product portfolio was highlighted. Stobicast L781 and Stobicast L780. Both systems were Polyurethane, could be tailored on production times and had gained the UL accreditation on Flammability and RTI requirement. 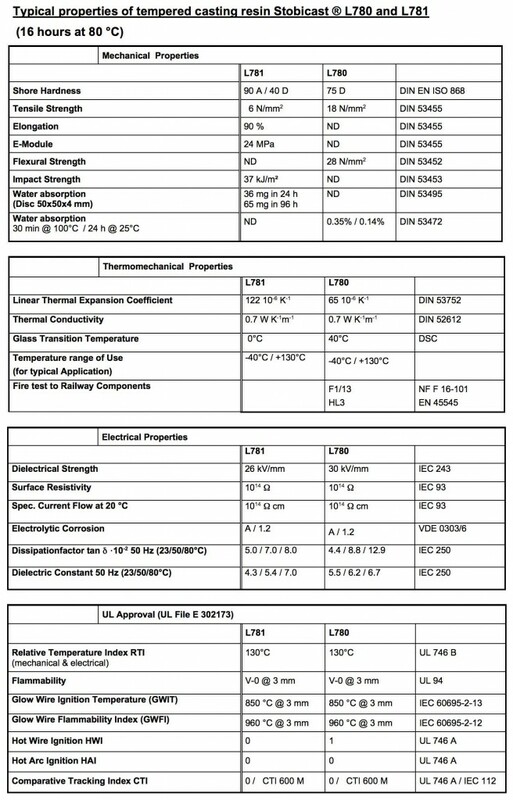 Table 2: a typical data sheet for two types of polyurethane system and the comparison between each. Both the Stobicast L781 and L780 systems had been utilized for many years in applications ranging from surface mount transformers, LED drivers, solar invertors, PCB assemblies, automotive components potting such as electronic braking systems, sensors, filters, submersible pumps and cable couplers. Rasmi was provided with a full technical summary, on both Stobicast potting compounds including electrical characteristics. As a standard the potting compound supplier offers a tailored design approach to give exact processing times and met the needs of Rasmi, matching the design criteria electrically and electronically with the processing characteristic to suit the geometry, namely excellent flow and air release. Rasmi chose the Stobicast L780 due to the increased hardness value over the Stobicast L781 system, which would assist in keeping vibration and noise levels of wound components in the assembly down during higher temperature running. They also identified, with the help of that they could utilize mixing equipment they already had as the ratio matched, considerably reducing the need for any equipment expenditure. After selection was made the two companies conducted lab trials.7 It is beneficial during the selection of a supplier to consider what their internal capability for test and evaluation is. Ensuring they can offer a comprehensive service and can quickly replicate production scenarios considerably reduces reliance on third parties and speeds up the design and development process. The supplier had a vast array of test equipment such as cycling chambers and tensiometers, commonly used to test levels of adhesion to potting boxes and components. Often the preference for initial trials is to pot a client’s assembly in a lab as this quickly allows the lab experts to determine if there are any issues with the geometry or initial design during the filling process. Assemblies were quickly filled and returned using the Stobicast L780 and Rasmi performed its own cycling tests on the assemblies. After a short delay to get these results and prove concept the next stage was pre-production trials. It was quickly found that the L780 material was a prime candidate. Another polyurethane material was also being considered however this supplier could not offer local support and supply, which to Rasmi was essential when dealing with a technical chemical product and process. The final stage was for onsite pre-production trials with the supplier assisting them to get the material into process. This final stage is key to the future success. As mentioned prior one of the key failures of two component systems is through poor and inconsistent mixing. Filling of the electronic assembly at Rasmi with Stobicast L780. The supplier specifically focuses on an extensive training program for technical sales staff and operates in close cooperation with equipment manufacturers. The company ensures clients have firstly the correct equipment and secondly that the client knows how to validate and QC daily production. It is always recommended to produce hardness samples at both start and finish of each run to ensure that there has been no change in the processing ratios during the production period. As a brief overview test were carried out on the mixing and dosing plant. The first check performed was ratio analysis taking several shots of both liquids from the mix head and determining these were on the ratio denoted to the Technical data sheet. Once this was assured a mixer was attached to the mix head. Commonly the biggest error made when using two component systems is to evaluate product by mixing into a bulk amount, commonly known as a cup shot. Although this does show curing time it does not monitor the synchronization of the two liquids as they leave the mixing head. If the two materials are not synchronized at the point of leaving the mix head this leads to an imbalance of ratio for the first part and final part of every shot. A cup shot will never show this imbalance, as it is impossible to section each to look for a small, but often troublesome, unmixed liquid. Rasmi was shown how to make a very simple yet effective test for synchronization. By running of a continuous bead from start to finish along a plastic sheet a clear visual representation of the mix quality was seen. If the bead shows poor mix at the start and end then this signifies that the machine is not synchronized with one material leading before the other, effectively it does not cure or does not reach the required properties as designated on the technical data sheet and replicate results by the Lab trials and client sample testing. This method also highlights any wear of gears or pistons pumps (the most common methods of ratio control and dispense). Any uniform poor mix or wet spots in the bead that are not specifically related to the start or end of the bead can be seen as material which has managed to by pass the ratio control system, due to wear inside the machine. Finally if the bead shows intermittent and none uniform patterns these can be associated with a blockage or foreign body inside the machines non-return valves. After both bead and cup shots were assessed the assemblies were filled and left to cure. The cup shot and beads are often retained for direct visual QC and can be incorporated into the ISO9001 procedures. hardness samples at both start and finish of each run to ensure that there has been no change in the processing ratios during the production period. As a timeline the project was completed within four months from initial consultation to first production, the biggest delay simply being the test period for the assemblies. An electronic engineer/designer does not generally undergo training in the use of chemical coating, potting and encapsulation systems. Most learning is on the job trial and error experience or by interaction with the chemical supplier. There are few recognized courses engineers can attend to cover these aspects of electronic and electrical assembly manufacture. As the potting and encapsulation process is generally the last process it is often not considered until the assembly has been designed. 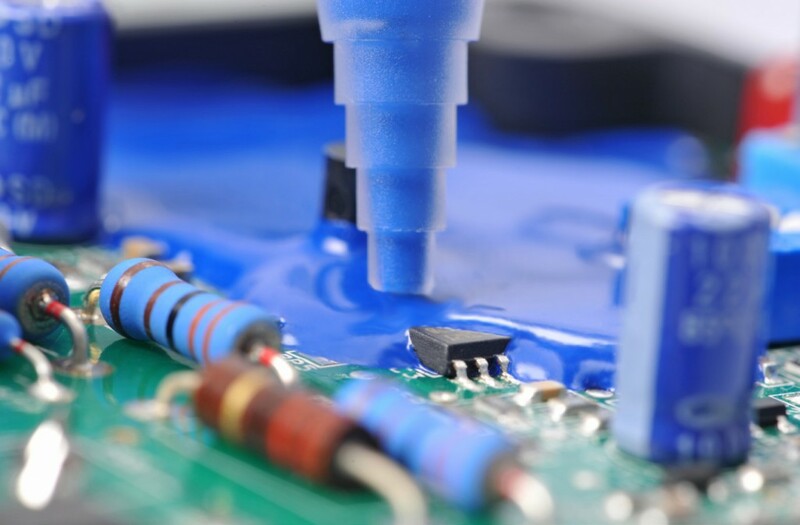 In many cases potting is considered after field trials due to conformal coating systems failing to protect the assembly or due to field failure returns highlighting electrical contaminants. There are a vast array of potting and encapsulation options in the market place with many manufacturers and distributors of solutions, often using brochure sales methods to offer highly technical chemical engineering solutions. The recognized solution for medium to high volume production Thermal Class B for potting and encapsulation is Polyurethane. It is essential that in any design, which fits this profile, you must consider material, process and supplier at the outset. Leaving it until the last minute or not assessing one key aspect, such as supplier capability and knowledge base will invariably result in redesign or worse, increasing costs per assembly. 4 UL-94 – Test for Flammability of Plastic Materials for Parts in Devices and Appliances, Fifth Edition (October 96), Underwriters Laboratories Inc.
6 Dir. 2011/65/EU, 3 January 2013 Restriction of Hazardous Substances Directive 2002/95/EC, (RoHS 1), short for Directive on the restriction of the use of certain hazardous substances in electrical and electronic equipment, The Waste Electrical and Electronic Equipment Regulations 2013. REACH (EC 1907/2006) aims to improve the protection of human health and the environment through the better and earlier identification of the intrinsic properties of chemical substances. This is done by the four processes of REACH, namely the registration, evaluation, authorization and restriction of chemicals. REACH also aims to enhance innovation and competitiveness of the EU chemicals industry. Ben Blundell is Sales Director of Stockmeier Urethanes UK ltd. He is also responsible for Stockmeier Urethanes GmbH in the Middle East, India and Asia. He has been involved in design, manufacture, quality and sales of potting materials for o ver 20 years. The author would like to thank Gary Hayward, Tim Blundell (Stockmeier Urethanes UK Ltd) Thomas Hausler and Melanie Opitz (Stockmeier Urethanes GmbH) for technical support, interviews and pictorial content.